Welcome to My Catholic Home. I’m so glad you’re here! At My Catholic Home, I am dedicated to helping you effectively and lovingly pass on the Catholic faith to your children. Whether you are a parent, teacher, or parish administrator, I desire to work with you to help bring the Catholic faith alive for the children in your life. While my speciality is the “Domestic Church” (teaching the faith to children at home), I also have experience with adults and teens. As a stay-at-home mom, who is a former teacher and parish administrator, I can help in the home, parish, or school setting. Check out the ‘hire me’ page, or sign up to follow my blog. Request a prayer board starter kit, or a free copy of my book and resource guide. 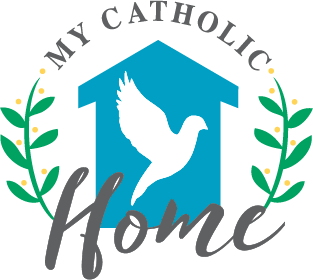 My Catholic Home is here to help you. Email me to find out more. Lindsay’s personalized prayer board has changed my prayer life. I am a busy mom of three kids and could not seem to carve out any time to pray or deepen my knowledge of my faith. When Lindsay came to my home and showed me how all the wonderful prayers and Catholic teachings could be organized on one prayer board, I was a little embarrassed at how little I actually had done for my faith before then. But in a matter of weeks, my life was already drastically different – I was memorizing new prayers, learning about Catholic teachings, and centering my family around Jesus. I can’t say enough about how this prayer space has changed my life.